Supported by ECOSS and its language and multicultural environmental outreach expertise, Young’s installed three stormwater cisterns that will keep more than 11,000 gallons of runoff out of the combined sewer system each year. The King County – Seattle Public Utilities RainWise partnership recently established a “big roof” initiative expanding its work beyond residential structures to capture and divert stormwater from larger buildings. You can see the Young’s cisterns here. Meantime, King County’s full list of winners – also including South Park’s Paulina Lopez, of the Duwamish River Cleanup Coalition – is here. The Seattle Department of Neighborhoods’ Small Sparks Matching Fund awarded Louisa Boren STEM K-8 funding to install a buddy bench and repaint the blacktop games on the school playground. A buddy bench is a bench where a child can sit if they need a friend. Others will see them and invite them to play. The school is requesting artwork ideas from school and community members for under the buddy bench. Sketches can include up to four colors. If you would like to submit an idea, email drawings with your name and email address, to amollerensha@seattleschools.org or drop them off at the Louisa Boren STEM K-8 (5950 Delridge Way SW) front office before Friday, April 26th. There will be a design selection meeting at Delridge Library (5423 Delridge Way SW), April 27th, from 12:00-12:30, where community members are welcome to come and help select artwork for under the bench. Another incident that started as a big response but was very quickly downsized – a Seattle Fire callout in the 9200 block of 17th SW. It’s now described in radio communication as a “porta-potty fire” and SFD’s investigator is being sent to the scene. West of Chicago Pizza Company is starting small, at 5604 Delridge Way SW, but expecting to expand as sales grow. Shawn is a resident of West Seattle and is here to stay; he is looking forward to supporting local nonprofits, too, as do so many local independent businesses. You can see the West of Chicago Pizza Company menu on the website and you can order there for pickup, or call 206-339-DEEP – that’s 206-339-3337. Thursdays through Sundays, 4 pm-10 pm (last order at 9:15 pm). We thank West of Chicago Pizza Company for sponsoring independent, community-collaborative neighborhood news via WSB; find our current sponsor team listed in directory format here, and find info on joining the team by going here. Since the city changed the Design Review rules, few projects have been scheduled for a full board review – there’s nothing on the Southwest Design Review Board‘s horizon right now – but several have had informal “early outreach” drop-in sessions, usually drawing a handful of neighbors, with the format and even the choice of notification methods left up to the developers. Another one of those sessions was held this afternoon, this time for the 14-rowhouse project planned to replace a 65-year-old house at 8415 Delridge Way SW. Project architects Novion Group scheduled the meeting for 4:30-5:30 pm in the Southwest Library’s community room. In addition to our reporter, three nearby residents showed up. Their concerns included poor drainage in the alley behind the property, explaining that it has a tendency to develop giant puddles. The project team said that will be addressed. Neighbors also wondered about the trees on the site; the project team warned that it’s early in the design process but most are likely to be kept. And they wanted to be sure that parking will be addressed for construction workers and, later, deliveries. The project itself includes one offstreet space per unit, to be accessed off the alley (which is discussed, along with other site characteristics, in this document that’s part of the project file). We asked when they hope to start construction; could be as soon as one year away, depending on how the process proceeds. WHAT HAPPENS NEXT: The architects will prepare a “design packet” for the Early Design Guidance phase, and the city will publish a notice when that’s available for review and comment (we’ll publish an update too). P.S. If you missed the meeting but have concerns/questions about the project, Novion has a simple webpage for it with comment options. 9:09 PM: Police and fire are headed to an address in the 9200 block of 17th SW for a ‘scenes of violence’ callout. More when we get it. 9:32 PM: SFD has closed out the call. Police will only tell us they responded to a report of a single gunshot. 10:16 PM: A Seattle Fire spokesperson tells us their role in the call closed quickly because the person had already died. The EDI fund, administered by the Office of Planning and Community Development (OPCD), and in coordination with Office of Economic Development, Office of Housing , Department of Neighborhoods, Office of Arts and Culture, and Office for Civil Rights, was created to respond to the needs of marginalized populations, reduce disparities, and support access to opportunity in healthy, vibrant communities. The initiative was championed by organizations responding to the impacts of historic disinvestment and ongoing displacement pressures in communities of color in Seattle. Promoting access to opportunity and economic mobility. Mitigating displacement of marginalized populations, businesses, and community organizations and helping them to thrive in their neighborhoods. Enhancing and building off the cultural assets within communities. Successful applicants will demonstrate a deep relationship with the community they are seeking to partner with and feature an inclusive community process, with community members serving in their organizational leadership. Organizations planning to apply for funding are strongly encouraged to participate in OPCD’s pre-application meetings. Requests for meetings will be accepted through May 31. Applications are due June 5. The mayor was also in West Seattle on Saturday, March 23rd, for the dedication of the renovated High Point Play Area (WSB coverage here). 1:01 AM: A Seattle Fire “full response” is headed to a Delridge residential building just south of Thistle. First units on scene report “light smoke.” Updates to come. 1:15 AM: Not a major fire; it’s under control, and so far no report of injuries. Firefighters are evaluating the building to make sure the fire didn’t spread into the building’s attic. 1:19 AM: And the fire is pronounced “tapped” (out). 1:39 PM: SFD confirms no injuries. They’re calling the Red Cross to help four people displaced by the fire, including two children. The fire’s cause is under investigation. West Seattle Crime Watch: Seen this stolen bicycle? Reader report from Kerri: “Friday 3/22, I had a bike stolen out of my garage on 15th and Barton/Cambridge. I have reported to the police.” Here’s what the bicycle looks like. • Replace the 21 units lost in the October 2016 fire and increase the total number of units on the site. • Create a mixed-income community with units serving residents at or below 30% of Area Median Income (AMI) and 60% of AMI. One note – today’s notice published by the city erroneously refers to it as a 50-unit project, which it was previously, but we’ve confirmed with SHA that was a error by the Department of Construction and Inspections. The notice explains how to comment in this stage of Design Review – deadline April 8th. Have ideas to share but couldn’t be there? 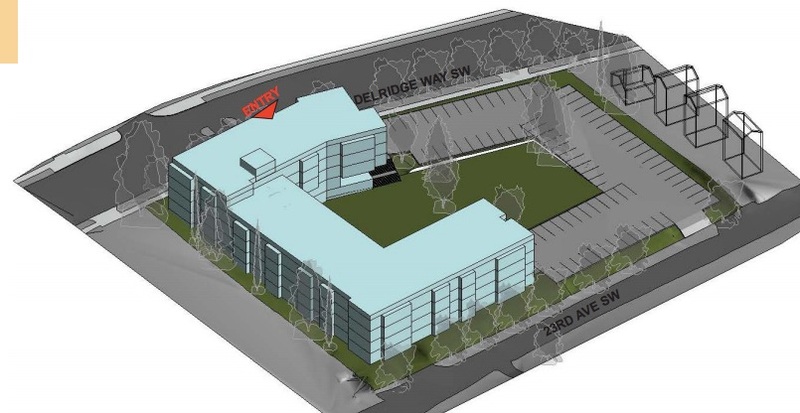 This survey on the Friends of Delridge Triangle website remains open. And stay tuned for “more … much more” ways to get involved, promised one of the community leadrers who’s been working on this for more than a year, Kim Barnes. We look forward to welcoming our community members tomorrow, Saturday, March 23, from 10 a.m. to noon at the Highland Park Improvement Club (1116 SW Holden). to share ideas how to redesign the Delridge Triangle at 9200 Delridge & SW Barton. Doors will open at 9:45 a.m. Snacks, professional child care with guided activities, as well as interpreters will be provided. Survey Time! Please take a few moments to take a survey about the Triangle here. 5:25 PM: We’ve received widespread reports of brief power flickers, and some heard two “booms.” Now there’s a report of a power line down at 26th/Juneau, with what firefighters arriving in the area describe as a “small brush fire” – they’re awaiting City Light. 5:55 PM: Just went by the scene. City Light is there. The downed wire has ceased “arc-ing and spark-ing.” The site is just east of the Delridge Substation. 5:57 PM: And now, a 6,200+-customer outage, mostly south of that site. Related? We don’t know. But some traffic signals are affected – on Barton at Westwood Village, for example, and Delridge/Holden. 6:07 PM: We are at WWV. Some stores are out but some (notably, east-facing) are not. 6:23 PM: A variety of areas are affected, including parts of Fauntleroy, where the culvert-info open house is on thanks to light from big windows. Above, another signal that’s out – 35th/Barton. Remember it’s a 4-way stop if it’s not working. 7:05 PM: Some areas got power back, according to texts and comments. The SCL map isn’t reflecting that yet. 7:15 PM: Now the map shows all but a few should have power back. If you don’t – please call SCL to be sure they know – 206-684-3000. 7:43 PM: SCL tweeted that a tree is to blame for the outage. Meantime, we’ve added nearby resident Betsy‘s video of the 26th/Juneau tree fire atop this story. 9:15 PM: 400+ customers are still out, per the outage map. 12:53 AM: Those 407 customers are still out. If you’re among them, please let us know when your power is restore – there’s no online record otherwise; the outage just vanishes from the SCL map (which we’ve just screengrabbed). Thanks for the tip about an early-morning emergency response at the Tug Inn. We followed up with SPD and SFD and here’s what they tell us: SFD medics took a 59-year-old man to Harborview Medical Center in critical condition with a gunshot wound. 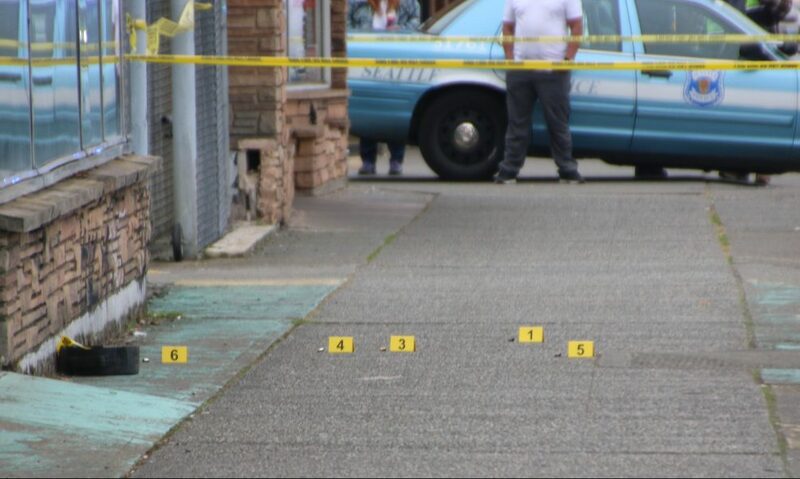 The full report isn’t available yet but SPD spokesperson Det. Mark Jamieson says the early details show police were called to the bar just before 12:30 am after a gunshot was heard in a restroom. That’s where they found the victim. Officers found a shell casing in the bathroom but not the gun. They don’t have information about the circumstances except to say they believe someone else was in the restroom with the victim at the time but left before police arrived, and there’s no description. 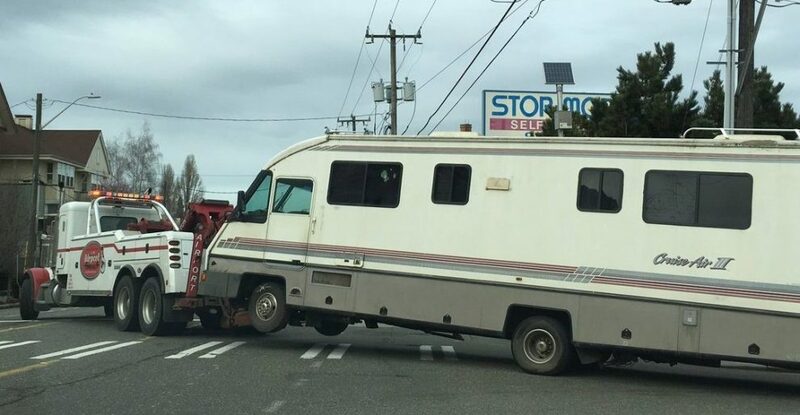 The RV was being towed westbound on Yancy, turning northbound on Avalon, one block west of the longtime parking area near WSHC. So we continued eastbound for a look: None on 28th, the area about which WSHC’s Dan Lehr had voiced the most concern when we talked with him a few weeks ago; one on SW Andover (whose owner is apparently a nearby housed resident, not using the vehicle as a residence). Just a few days ago, we had noted 10 in the area. The disappearance of RVs there led us to wonder about another area long popular for RV parking, Harbor Avenue; we subsequently found that stretch, where as few as three were parked in recent days, was up to 10. It is my understanding an RV was towed in the area (Thursday), but it was not through the RV Remediation Pilot or an organized SPD event. SW CPT had tagged the area and the RV occupant ordered a private tow in order to comply with the 72hr law. I believe the vehicle did not run and was towed by the occupant to a repair shop. SW CPT would be a reference to the Southwest Precinct Community Police Team. We went through both the 28th/Andover and Harbor Avenue areas again today before writing this and the numbers were the same in the respective areas as we’d noted on Thursday. 3:35 PM: A big Seattle Fire response is headed to a possible house fire in the 9000 block of 17th SW. Updates to come. 3:48 PM: Now they’re sending Ladder 11 back to check out “possible extension” of the problem. Our crew at the scene, meantime, has been told it was a chimney fire. 3:59 PM: Engine 11 and Ladder 11 firefighters are still investigating to be sure the fire didn’t spread beyond the chimney. Please join us for our community design meeting on Saturday, March 23, from 10 a.m. to noon at the Highland Park Improvement Club (1116 SW Holden). 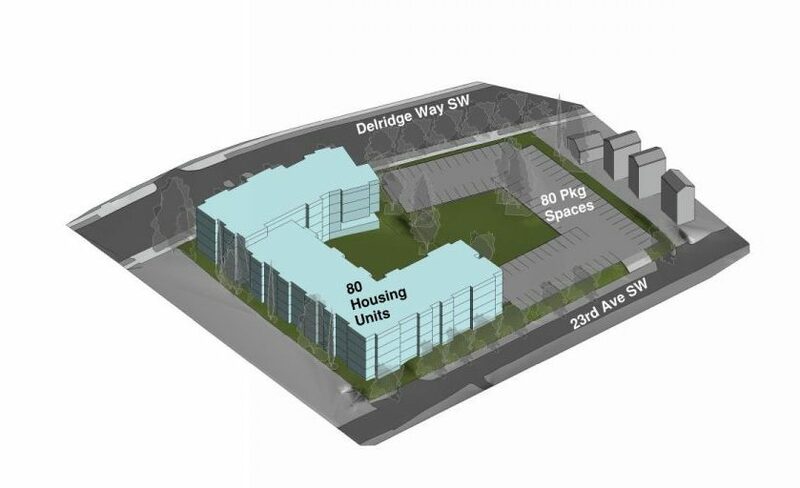 toshare your ideas about how to redesign the Delridge Triangle at 9200 Delridge & SW Barton. That 65-year-old house at 8415 Delridge Way SW is on a big lot (15,300 square feet) now planned for 14 rowhouse-style townhouses and 14 offstreet-parking spaces. 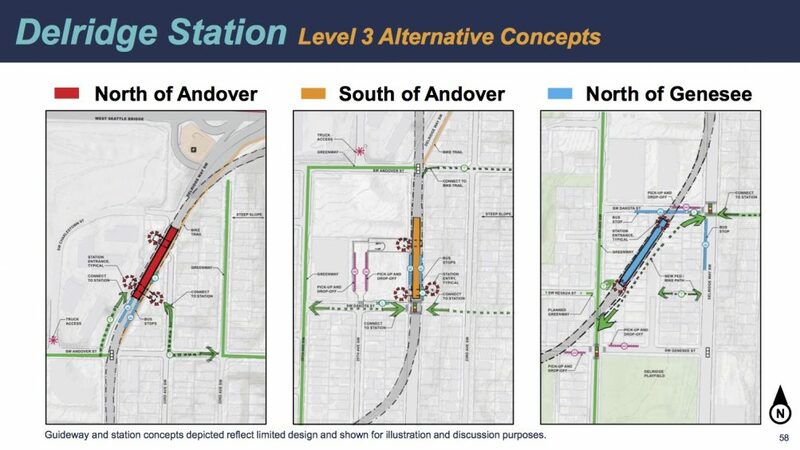 It’s the latest West Seattle project added to the city’s list of sites going through the “early community outreach” phase of Design Review. That means the project team will schedule a community meeting to talk about the design; nothing’s on the schedule yet. 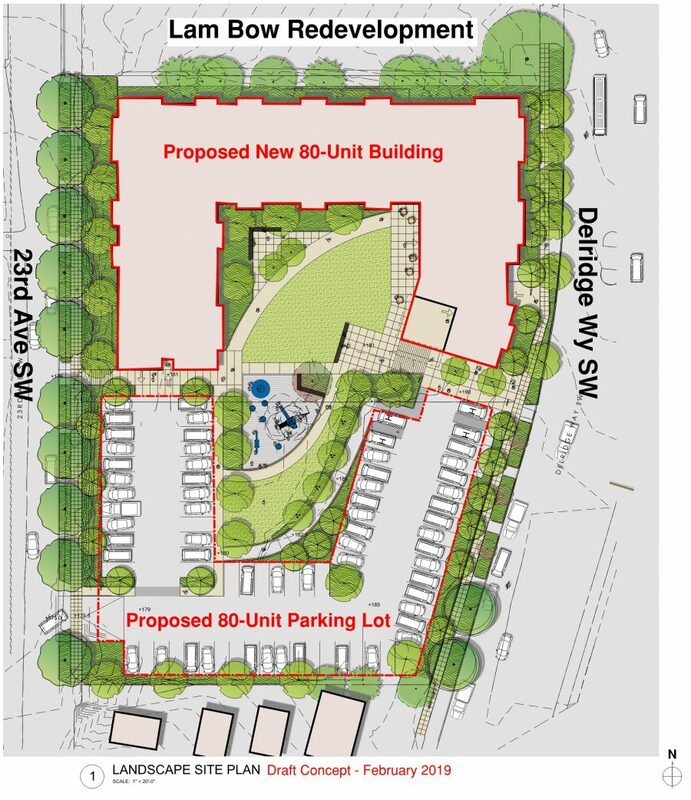 The site plan shows seven units facing Delridge, the other seven behind them, and the parking area on the alley. Cost of the project is estimated at around $35 million; Moore explains, “The existing building will cost at least as much to rehabilitate as a new building and likely more. We were planning on saving it until we conducted all the necessary analysis to determine how much rehab was needed.” Another change along with the increased number of apartments: “Due to costs, we won’t be building the underground parking as we had originally planned, but we will be providing one parking space for each unit on a surface parking lot” – 80 spaces for 80 apartments. Most of the new units, Moore says, will be 2- and 3-bedroom apartments, and they’re already working with current tenants regarding pre-demolition relocation. The full early-design proposal should be on the city website soon (here’s a flyer in the meantime); the change in process means no Design Review Board meeting, but public comments will be sought and accepted. The Friends of the Delridge Triangle — an all-volunteer, grassroots gathering of neighbors — has selected Seattle-based MAKERS Architecture and Urban Design to lead a community design process for a reimagining of the Delridge Triangle right-of-way property at 9200 Delridge Way SW.
All community members are invited to a community design meeting on Saturday, March 23, from 10 a.m. to noon at Highland Park Improvement Club (1116 SW Holden). Doors will open at 9:45 a.m. Snacks, professional child care with guided activities, as well as interpreters will be provided. This is an opportunity for our community to come together and imagine a public space for us all. We Need Your Input! To help us tailor these efforts to improve the Triangle, please take a few moments to take our short baseline survey here. Thursday night or last night, our son’s matte black BMX bike was stolen off our porch. It has been reported to the police. It has whitewall tires and no brakes; he took them off – it’s a bike for doing tricks; we had it shipped from Europe. This happened on the 5600 block of 25th Ave SW. Please be on the lookout for it.